A dignified elephant, dressed in a green suit and wearing a yellow crown, walks upright across the page. This image—both absurd and endearing—has become instantly recognizable to several generations of readers throughout the world. The exhibition Drawing Babar returns visitors to the two essential moments of Babar's creation: when Jean de Brunhoff and, years later, his son Laurent set down their initial thoughts on paper. Their earliest drafts shown in juxtaposition with their finished watercolors allow viewers to track the changes both subtle and substantive that both men made as they refined their work, bringing together word and image with elegance and exuberance. In 2004 the Morgan acquired the working drafts and printer-ready watercolors for Histoire de Babar, le petit éléphant (1931), the first book by Jean de Brunhoff (1899–1937), and Babar et ce coquin d'Arthur (1946), the first book by Laurent de Brunhoff (b. 1925). Together these two collections, shown virtually in their entirety for the first time, provide an extraordinary record of the working methods of the two men, both painters turned storytellers. From the naming of Babar himself (first called simply "Baby Elephant") to the introduction of the beloved character Queen Celeste—not present in Jean de Brunhoff's first draft—these early sketches and watercolors provide an intimate look at the creation of an enduring fictional world. Supplementing the Morgan's important collection of manuscripts and drawings are splendid copies of first editions of the earliest Babar books, notable for their large format and stunning graphic appeal. Drawing Babar is accompanied by a fully illustrated catalog by Christine Nelson, the Morgan's Drue Heinz Curator of Literary and Historical Manuscripts, with an essay by New Yorker contributor Adam Gopnik and a foreword by William M. Griswold, the Morgan's director. Drawing Babar: Early Drafts and Watercolors is made possible by The Florence Gould Foundation. Chilton Investment Company, Inc. is the corporate sponsor. Generous support is also provided by The Grand Marnier Foundation, T. Kimball Brooker, The American Society of the French Legion of Honor, Inc., Hubert and Mireille Goldschmidt, and Barbara and James Runde. We gratefully acknowledge the cooperation of the Consulate General of France in New York and the Cultural Services of the Embassy of France in New York. 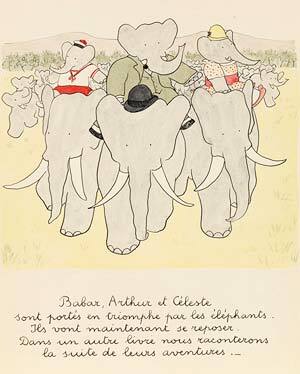 Jean de Brunhoff , "The elephants carried Babar, Arthur, and Celeste in triumph," study for Histoire de Babar, le petit éléphant, 1931, watercolor, The Morgan Library & Museum. Gift of Laurent, Mathieu, and Thierry de Brunhoff, and purchased with the assistance of The Florence Gould Foundation and the Acquisitions Fund, Fellows Endowment Fund, Gordon N. Ray Fund, and Heineman Fund, 2004.